Best Nintendo (NES) games are calculated by game ratings and members "Top Nintendo (NES) Games" List. 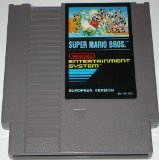 Best Nintendo (NES) games are updated daily. Synopsis: You play as Little Mac, a boxer bound to become the world heavyweight champion - but in order to do so, must battle thirteen of the world's best boxers including King Hippo, Piston Honda and Bald Bull leading to a showdown with Iron Mike himself.